Noe: The Book | a blog by the author of "Noe: A Father-Son Song of Love, Life, Illness, and Death"
What my be the last show for Noe in this post-publication period is upcoming this Saturday. Recorded in May at my home, a news segment of short but unknown n length, is set for the 11 PM News hour this weekend. Hope you will tune in and continue to spread the Noe word. 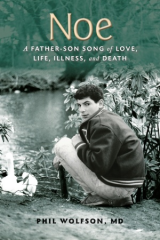 The book is about Dr. Wolfson’s journey he took with his son who was diagnosed with leukemia. The is a how to and how not to manual told as a story on how to deal with life, death and loss. Noe is the raw stuff of father/son connection through the joys of life and the crushing blow of illness and the threat of death for a conscious, near seventeen year old boy/man. Sorry folks for the booboo. Channel 9 in LA is a CBS affiliate and we are on a news segment. Here we go! I will be doing a television interview of about 5 minutes length on public TV in LA this Monday. Hope you will tune in!